Optimal wireless charging for all Qi-enabled devices arrives in the Boost Up Wireless Charging Stand. The Boost Up delivers 7.5-watt optimal charging for iPhone, 9-watts for Samsung devices, and up to 10-watts for all other Qi-enabled devices including Sony and LG. The stand is also carefully engineered to minimize interference and protect phone functionality while charging. An included 5-foot AC adapter ensures accurate power output, and multiple colorways are available for a personalized choice. iPhones optimally charge at 7.5W. This Belkin charging stand is tuned to deliver exactly 7.5-watts of power to compatible Apple devices, making it the perfect iPhone XS wireless charger, iPhone XS Max wireless charger, and iPhone XR wireless charger. Samsung smartphones optimally charge at 9W. This Belkin wireless charger is tuned to deliver exactly 9-watts of power to compatible Samsung devices, providing the fastest possible charge and making the perfect Galaxy S9 wireless charger and Note9 wireless charger. All other qi-enabled smartphones, including Sony and LG devices, optimally charge at 10W. 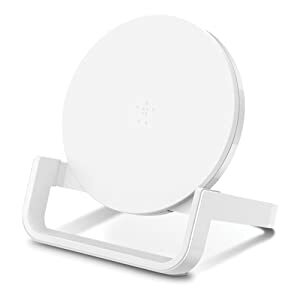 The Belkin Boost Up Bold Wireless Charging Stand is tuned to deliver up to 10-watts of power, making it the perfect LG wireless charger, as well as a true universal wireless charger solution. Apple iPhone XS, iPhone XS Max, iPhone XR, iPhone X, iPhone 8, iPhone 8 Plus / Samsung Galaxy S9, S9+, S8, S8+, S7, S7 edge, S6, S6 edge, Note9, Note8, Note5 / LG V30, G6 (US version only), G4 (optional), G3 (optional) / Sony Xperia XZ2 / Microsoft Lumia 1520, 1020, 930, 929, 928, 920 / Google Nexus 4, 5, 6, 7 (2013) / BlackBerry Priv. Looking to the future of technology for over thirty years, Belkin is the number one third-party maker of wireless charging accessories. * The goal at Belkin is to create a future free of cluttered cables and a world where wireless charging is accessible from anywhere. All Belkin products are designed on-site in California and produced with quality control checks throughout the manufacturing process. Belkin has its own internal manufacturing facility that has passed the ISO (International Organization for Standardization) 9001 quality management requirements. For anything produced outside this facility, Belkin’s quality control specialists are on-site every step of the way. Rigorous testing and quality control throughout the manufacturing process keeps Belkin ahead of the pack while a Connected Equipment Warranty offers total peace of mind. The Boost Up Bold Wireless Charging Pad 10W delivers offers optimal wireless charging for iPhone models 8 and later including iPhone XS, XS Max and XR, as well all Qi-enabled devices from Samsung, LG, Sony and more. Charge in landscape or portrait mode, while enjoying full access to apps, calls, texts and more. 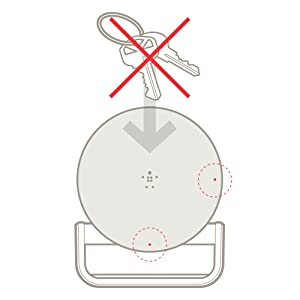 An LED light alerts you to foreign objects, such as keys or coins, on the wireless charger that could affect charging. Foreign object detection (FOD) helps to prevent the charger emitting unnecessary power and heat that could damage your smartphone and other heat-sensitive items. Placing magnetic mounts, cases or other objects between your phone and the charger might reduce performance or damage magnetic strips or RFID chips like those found in some credit cards, security badges and passports. If your case holds any of these sensitive items, remove them before charging or make sure they aren’t between the back of your phone and the charger.